Shape: This board blends the huge 9mm single concave, into a two step rocker template giving maximum bite and glide through the mid section. 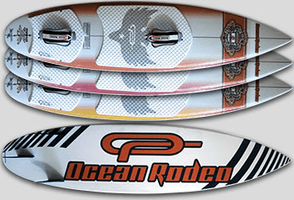 The tri fin thruster rounded pin tail sets up quick and produces tight radius turns at speed. Skill Level: Perfect for intermediate to advanced riders. Although this is a stable board, it is extremely responsive. Fin Type: 11.75 cm tri fins. Minim Tuttle fin boxes for superior strength. Construction: EPS. The Mako Surf is the worlds first Thermo formed / (snowboard style construction ) surfboard! Rugged Duraclear top and bottom for superior abrasion / impact protection compression molded around and EPS foam core.